Here is my first attempt at the route. Trying to do this trip in 2 weeks, which is a bit tight, but just about doable, riding around 100km a day, with some days for sightseeing. I’ve put clickable links to some of the places that we’ll stay. Total : 950km + 50km faffing about getting lost = 1000km!!! I now think it might be better to ride from Mandalay to Yangon. I think the region around Mandalay is more touristy, so might be better to get started there. 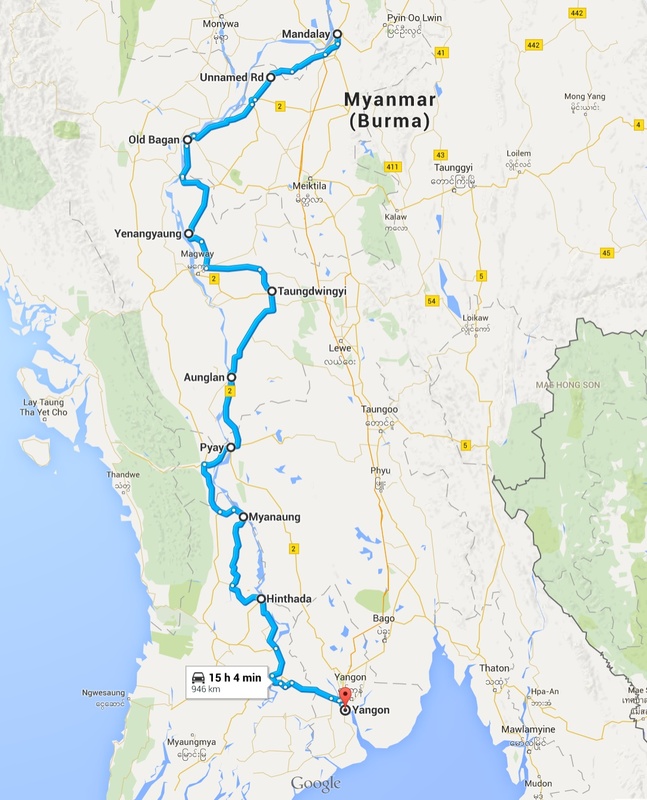 It will be 2 days to Bagan, and then we can have a “day off” to sight see round Bagan, and then head off south to Yangon…. Flights are a little tricky. You can’t fly direct to Burma from the UK. Best option looks to be a BA flight to Bangkok in Thailand, and then get a Bangkok Airways flight to Mandalay. We can then do the reverse trip from Yangon.